As we continue our series honoring the local heroes of the War of 1812, we would like to share the interesting tale of the brothers Meacham. Captain John Meacham and Colonel Thomas Standish Meacham were leaders in our communities and leave behind a wealth of history. The eldest son of Isaac and Lucy, John was born in 1777 in Williamstown, Massachusetts and the younger Thomas was born in 1794 in Pawlet, Vermont. Both were great-great-great grandsons of Captain Myles Standish, a famous military captain who arrived on the Mayflower with the early Pilgrims to settle Plymouth, Massachusetts. The Meacham families were some of the early settlers of the Richland area. In 1810, John and his wife Polly moved their family to the village of Pulaski. He opened its first mercantile on the corner of Bridge and Jefferson Streets and was later joined in this enterprise by Polly’s brother, Silas. John was one of the original nine members of the First Congregational Church of Pulaski and, together with another brother Simon, was among its first board of trustees. The founders organized the church in Pawlet, Vermont in anticipation of their relocation to Pulaski. Following his brothers, Thomas and his wife Sally soon left Vermont and settled into the Sandy Creek area. By the start of the War of 1812, John had recruited many of his neighbors to form a military company. They were called upon to defend Sackets Harbor on two occasions and Oswego once. 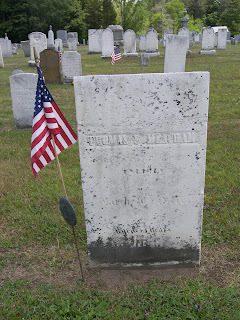 He died in Richland just after the war and now rests with his family in the Pulaski Village Cemetery. Thomas was as colorful an addition to the community as John was a civic leader. He became a commandant and local military leader himself and, for many years, led the annual training on the village green in front of the courthouse – reportedly one of the best training grounds in the area. With Thomas’ flair for presentation, these lively events were as much for play as for drill and drew participants and spectators from near and far. Despite the popularity of these events, Thomas may have been better-known for his adventures in cheese-making. In 1835, he devised a plan to create an enormous cheese round (1,400 pounds) as a gift to President Andrew Jackson. Thomas accompanied the cheese to Washington (D.C.) to make the formal presentation to the president from the “people of the State of New York.” The gift was met with cheers and ovations and, on February 22, 1836, President Jackson invited one and all to partake of the cheese in celebration of Washington’s Birthday. Just ten years after this triumph, Thomas died and is now interred in the Pulaski Village Cemetery with his brother, John. 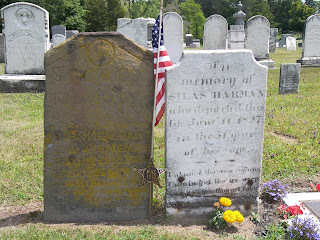 The aforementioned Private Silas Harmon (sic) was also a veteran of the War of 1812. He was born in Pawlet, Vermont in 1776 to Joel Harmon Jr. and Chloe Sheldon. Along with the Meacham brothers, he was a founding trustee of the First Congregational Church of Pulaski. Silas relocated to Richland with the Meacham families and the church congregation. His first wife, Jemima Terrell, died in 1814 and he remarried to Lucy Wales of Norwich, Connecticut. Silas joined John Meacham in the mercantile business, and the two passed the firm on to Silas’ nephew, Milton. Silas then went on to open a tavern where he orchestrated the famous 1823 Revolutionary War salute to the 32 surviving veterans in Richland. He died four years later and is buried in the Pulaski Village Cemetery. Silas’ brother Major Joel Harmon III was in the War of 1812 as well. A musician, Joel is perhaps more well-known for writing “The Columbian Sacred Minstrel”, a book of music and anthems published in 1809. The introduction of this new style was his opposition to the fugue style that was popular at the time. Joel was a music teacher in Richland before moving to York, Pennsylvania where he died in 1833. As we continue our series commemorating local soldiers of the War of 1812, we look forward to including yours. Please e-mail me at kjordal@oswegocounty.com to share your stories. If you would like more information about historical sites and genealogy in Oswego County, please visit our Web site at http://www.visitoswegocounty.com/.